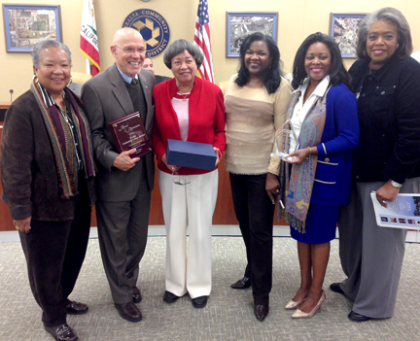 The Western Regional Council on Black American Affairs made a presentation at the Board of Trustee’s meeting on Tuesday, Feb. 25, 2014, recognizing the Peralta Community College District and president of Laney College, Dr. Elñora T. Webb. Peralta Chancellor, Dr. José M. Ortiz, second from left, was presented with a plaque, and Dr. Webb, second from right, was honored for her work at Laney College. Also pictured are Carol Belle-Thomas Moss, far left, NCBAA co-vice president for public relations, Dr. Regina Stanback Stroud, president of Skyline College, right, and from the Peralta Colleges, Anita Black, far right, and Shirley Coaston, center.